USB C Hub,EATOP USB C Adapter 3.1 with Type C Charging Port,SD/TF Card Reader,2 USB 3.0 Ports for New MacBook Pro 13'' and 15'' 2016/2017,and more USB C Devices (Space Gray) by EATOP at AABX. Hurry! Limited time offer. Offer valid only while supplies last. EATOP's USB C Adapter is the newest addition to our USB-C collection and the perfect companion for your 2016 MacBook Pro and 2017 Macbook Pro. EATOP's USB C Adapter is the newest addition to our USB-C collection and the perfect companion for your 2016 MacBook Pro and 2017 Macbook Pro. Compatible with both New MacBook Pro 13" and 15" 2016/2017 and more. 5 in1 Design features a Thunderbolt 3 port, USB-C port, 2 USB 3.0 ports,SD/Micro Card Reader. Accessing your media is easy with the EATOP USB C 5 in 1 HUB-and no drivers are required. 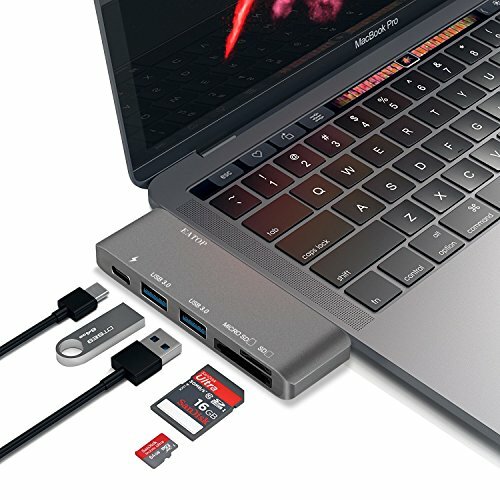 Utilize your MacBook Pro's Thunderbolt 3 port for pass-through charging and quick data transfer, all without sacrificing your USB 3.0 ports and Type-C port. Complement your products with the Pro Hub's brushed aluminum design for a sleek and modern feel. EATOP's 12 Months Worry-free Warranty & dedicated email customer support, ensures long-lasting enjoyment of your purchase. 【Simple and Convenient Design】The Slim Type-C USB 3.0 Hub with Multi 5 Ports, A Integrated design Can support 5 device work at the same time. Simple, lightweight, portable and convenient. Easy-to-use design makes it simple to take the Type-C USB Hub with you anywhere you go, perfect for home use and office or business and travel. 【Plug and play】supports hot swapping/plugging. no need to install any software, drivers, or any complicated process. You can easily recharge and transmit data safely at the same time.Type C connector with EMI protection, so it will not interfere with your wireless device.